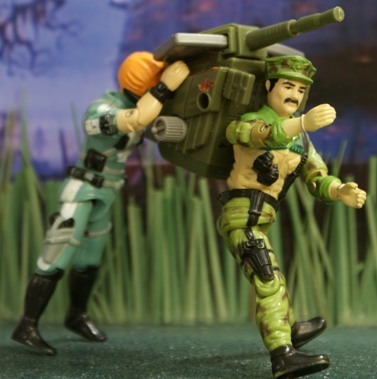 Remember the 80’s, when the Real American Hero line was still based in a not-too-distant future military style based on a great deal of cutting edge equipment, like anti-aircraft guns that could be strapped to a soldier’s back? Surely nothing so silly would have been released in Joe’s halcyon decade, right? Well, it was 1987, the same year that Cobra released its most isidious weapon to date, a vertical one-man driveway egder. Little do most people know, this weapon is based in reality. The Dollar General Dynamics WTH-42, though an intriguing idea in theory, never made it past a working prototype stage, as it injured more operators than it did shoot down potential targets. Testers and army doctors not so lovingly referred to it as the “lumbar strainer”, the “sacroiliac ruiner” and even “widowmaker.” Naturally, the Department of Defense passed on its use within the regular armed forces. They had no compunction about lending the design to Hasbro, on the grounds that they never reveal its real life origins. Through the Freedom of Misinformation Act, now the story can be told. See people, I’m working hard for you every day, like it or not. I missed out completly on 1987 stuff. Interesting. That is an interesting bit of info even though it doesn’t make the brainiacs at General Dynamics look too bright, does it? One does learn something new everyday while visiting here. Some of the motorized accessories were better thought out than others: I only had the Scuba Pack which I remember giving to Wet-Suit and it rocked. Like most water based wind-ups, it was a cool little gadget. I actually have come to like these little guys, and the Motorized Vehicle Packs of ’88. So far I have the 1987 Radar Station and Helicopter pack, and the ’88 Tank Car. I think they’re actually fun little vehicles. In my ‘verse, I use them as one-of-a-kind prototypes. “Dollar General Dynamics”? Aww, don’t feel bad. The Dollar General figures are all right. 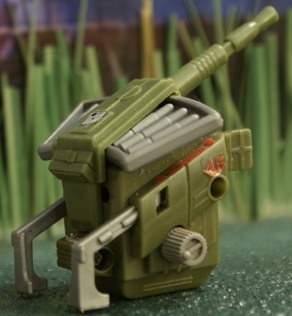 I liked some of the Action Packs like the Pom-Pom gun and Heli-pack (in fact, I was hoping that we might of seen some of these again bundled with a Joe figure as a ‘Retaliation’ store exclusive). However, I’m not feeling it with the Anti-Aircraft gun. The idea that you could strap heavy duty weapons systems to a soldiers body is absolutely ridiculous. Metalhead and Fast-Draw are two of the more silly ideas in the vintage line. Having served in the army and NG for years, I can tell you first hand the recoil and heat even on something as small as 50 cal.machine gun is quite formidable,let alone a missle system or a larger caliber weapon! However, the PAC/RAT series was pretty clever and at least plausible…unlike the toy shown here! Well, as Leatherneck and Wet-Suit in the image there have clearly died trying to use the damned thing, I’d say it needs some bugs worked out. The only thing I’ve figured is that these things are supposed to be carried by two people. Perhaps Hasbro back then forgot to put that in the descriptions. I just remember those Action Packs being everywhere. They must’ve flopped, because I saw them in the early 90’s.